[Satnews] Arianespace and ViaSat Inc. (NASDAQ: VSAT) have contracted for the launches of ViaSat-2 and a ViaSat-3 class satellite. Both ViaSat-2 and ViaSat-3 class satellites are geostationary satellites and operate in the high capacity Ka-band frequencies. ViaSat-2 and ViaSat-3 will each weigh approximately 6,400 kg at launch and will be injected into geostationary transfer orbit by the Ariane 5 ECA, respectively, during the first quarter of 2017 and by late 2019/early 2020. 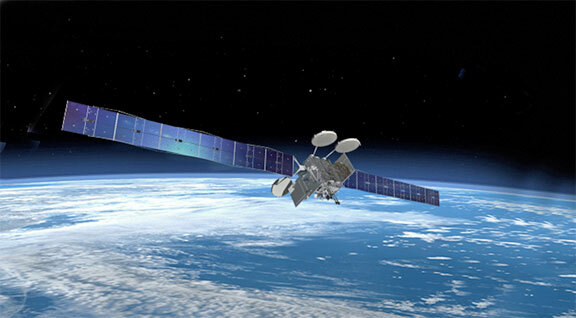 Boeing Satellite Systems in El Segundo, California, is the build partner on both satellites. These launches will take place at the Guiana Space Center, Europe's Spaceport in Kourou, French Guiana. Artistic rendition of the ViaSat-2 satellite. Image is courtesy of ViaSat. ViaSat is focused on providing affordable, global, high-speed broadband internet with competitive advantages on the ground, in the air, and at sea—as compared to other satellite and terrestrial alternatives. The ViaSat-2 satellite system is expected to improve speeds significantly, reduce costs and expand the footprint of broadband services across North America, Central America, the Caribbean, a portion of northern South America as well as the primary aeronautical and maritime routes across the Atlantic Ocean between North America and Europe. The satellite will offer approximately double the bandwidth of ViaSat's previous generation satellite, and seven times the coverage. An ultra-high capacity satellite platform, ViaSat-3 comprises three ViaSat-3 class satellites plus advanced state-of-the-art ground network infrastructure, enabling the first truly global high-speed broadband service. Each ViaSat-3 class satellite will offer more than 1,000 Gigabits per second (Gbps) or 1-Terabit per second (Tbps) - of bandwidth to enable high-speed internet, including video streaming, at scale across multiple applications simultaneously. The first ViaSat-3 satellite system will address the Americas, followed by a second satellite system serving Europe, Middle East and Africa (EMEA) and a third system planned for the Asia Pacific region. The ViaSat-3 satellite platform is expected to deliver unprecedented coverage, capacity, cost, service and flexibility. Mark Dankberg, ViaSat's Chairman and Chief Executive Officer, said, "We have a long-standing relationship with Arianespace, and have committed to launch two ViaSat satellites in the next four years with them. By partnering with Arianespace on ViaSat-2, we build confidence in our plan to bring new high-speed service plans across the U.S. and the region by the middle of 2017. These service plans are made possible with the innovative technologies underlying the ViaSat-2 network. Beyond ViaSat-2, we plan to launch a ViaSat-3 class satellite with Arianespace, where we will offer our customers even higher speeds and higher quality broadband services - ranging from faster home internet services and in-flight video streaming to high-speed, high-value connectivity for government aircraft missions. These two satellite launches are key in the evolution to bring a global broadband communications network to market that delivers affordable, high-speed internet access to all." Arianespace Chairman and Chief Executive Officer, Stéphane Israël, said, "Arianespace is proud to be entrusted with the launches of ViaSat-2 and one ViaSat-3 class satellite, and thus be given the opportunity to contribute to the implementation of space-based solutions for global connectivity. I thus want to express my gratitude to ViaSat for its confidence and for involving Arianespace in the development of its broadband communications network. With this contract, Ariane 5, which completed last month its 70th successful mission in a row, is confirmed as the reference launch vehicle selected by most private satellite operators worldwide."